The Microfuge 16 offers fast, powerful micro-centrifugation in an easy-to-use, compact design. It’s a powerful machine that spins quietly at 16,163 x g (14,800 rpm) for fast pelleting or isolation of DNA, RNA, proteins and viruses. It’s compact and easily fits in the tightest of workspace environments with a height under 7 inches and a footprint measuring 8.9 by 10.5 inches. Microfuge 16 is productive and maximizes sample throughput with an innovative autoclavable 24-place rotor rated at 16,163 x g. The centrifuge is reliable and features a brushless induction drive, safety auto-lock closure system and novel air-cooled rotor bowl for years of safe, high-performing operation. It’s efficient with reduced process time with fast acceleration and deceleration rates. 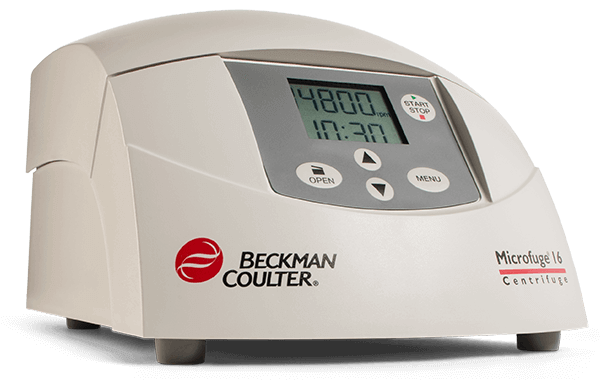 This centrifuge is versatile and offers added flexibility to your protocols with choice of pulse, timed or continuous runs. The Microfuge 16 is simple and enables easy cleaning and maintenance. It’s also convenient and presents a large bright display with simple intuitive push button key entry and automatic lid release at sample run completion. Lastly, it’s adaptable and processes a wide array of microtubes from 0.2 to 2.2 mL with a choice of standard or soft start/stop programs.